Overeating means a lot of health problems arising in your life. While you may enjoy your food or you may feel like you can’t stop eating, the tips left for you here today are going to be helpful. If you want to prevent overeating, it may take some practice but there are certain techniques that can help you. Finding out more about these techniques is going to give you the assistance you need to live more nutritiously and stop overeating. As you get ready to eat, one of the things you are going to want to do is eat. 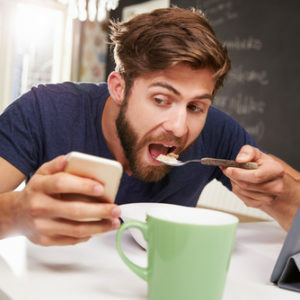 You should not be using any type of electronics or having any other distractions while you eat. You should have your television, phone or other electronics turned off. In addition, you should not be reading while eating either. It is too easy to get lost in a book and not pay attention to how much you are eating. When you eat, it should not be a race. You should take your time and slow down. It takes the brain some time to transmit the message saying that you have had enough to eat. If you are eating fast, you can get overly full before that message is sent. Many people eat when they are bored, angry or they just want something to do. If you are eating when you aren’t hungry, you aren’t going to know when to stop eating because you won’t have that message saying you are full as easily. You may want to implement a scale such as 1 through 10. You can use 1 for feeling famished, 5 for being alright and 10 for being overly full. You should begin eating when your rating goes down to about a 3 which would be hungry but not too hungry so you feel you must eat a whole ton. Ask yourself if you are hungry or still hungry. When you are eating take a minute every few minutes to ask yourself if you are still hungry. If you aren’t hitting that 3 or less on the rating scale, you are going to be alright without eating more at that moment. Satisfied would mean you are about a 6 on your scale. It is going to take you some time to get used to not overeating. It will take some practice. However, if you keep trying to meet these tips above you can achieve your goals of not overeating. Think about the body you want. Think about the health you want to have as well. You can stop overeating and the tips above can help. In addition to the above tips, you should try using Flat Belly, a weight loss supplement that will curb cravings too.